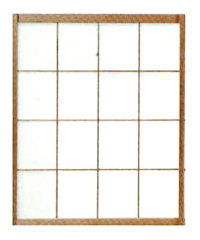 Kumiko is the term for the refined lattice work on the sliding doors, shoji (papered screen doors) and decorative transoms of a traditional Japanese style room. 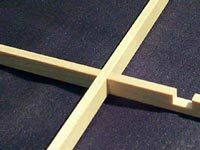 The grid pattern of kumiko is usually 6-10mm. Competition amongst skilled craftsman has resulted in high grade lattice work that has measurements ranging from 2 – 4.5 mm. 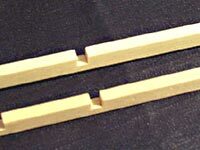 Regular shoji is comprised of the type of wooden joints seen in the photo. These joints are then put together. The next photo shows an example of this. Using this basic pattern, a variety of arrangements and designs can be implemented.